Instructions to have only State House official Photographers take pictures of President Sata have backfired. State House has posted pictures of the ailing dictator sleeping on the Presidential Chopper soon after disembarking from Emirates Airlines. The pictures from State House captured by Eddie Mwanaleza have gone viral on the Internet. 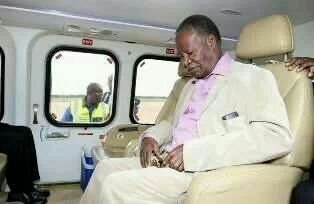 Sata fell asleep immediately he boarded the Presidential Chopper at Kenneth Kaunda International Airport enroute to State House. Meanwhile, it may not only be State House Photographer in trouble but the Zambia National Broadcasting Corporation for showing pictures of the President struggling to disembark from the Emirates Airlines. ZNBC on its main Television News bulletin showed Sata stopping three times before finally stepping on the ground to greet people. He did not spend much time greeting but quickly boarded the Presidential Chopper and fell asleep before it could even take off.